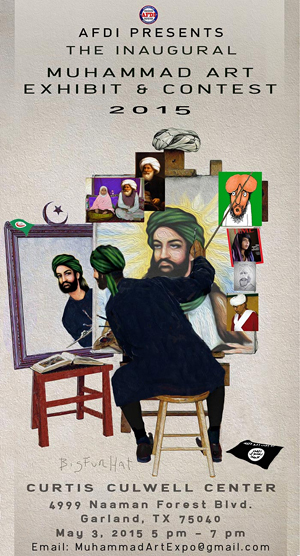 Don’t miss my WND column on the AFDI Muhammad Contest and Art Exhibit. Meanwhile, a carnival in Germany canceled plans for a Charlie Hebdo float. A cartoon museum in Belgium canceled plans for a Charlie Hebdo tribute. An art museum in Paris removed an artwork from exhibit after Muslim threats. This stunning cowardice proves, yet again, that it hardly ends with cartoons. It begins there. The West is giving these savages the ultimate power over us. They seek to control what we say, what we think, and how we live. These savages need to be held to account, and the West has to stop this pathetic cowardice and submission to barbarity. They’re just cartoons. Enough already. The Muslim world must stop imposing its savagery on the non-Muslim and secular Muslim world. 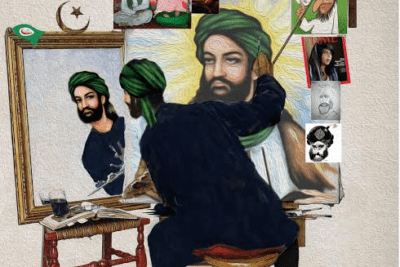 It’s time to stand up.That’s why my organization, the human rights advocacy group the American Freedom Defense Initiative, or AFDI, will be holding a contest for cartoons of Muhammad, and an exhibit of Muhammad cartoons this May in Garland, Texas. The keynote speaker will be Dutch freedom fighter and Parliamentarian Geert Wilders – one of the very few politicians on the international scene who dares to speak the truth about the jihad threat. The contest will be online, with entries posted at the AFDI website. The winning cartoon will be announced at the May 3 cartoon exhibit in Garland. The winning cartoonist will be awarded a $10,000 prize. The cartoon exhibit will feature images of Islam’s prophet, both historic and contemporary, and speeches by leading voices of freedom and internationally renowned free speech advocates. Also speaking will be brave artists who are unbowed by violent threats and determined to stand for the freedom of speech. The exhibit will be held at the Curtis Culwell Center in Garland on Sunday, May 3. This was the site of a Muslim conference denouncing “Islamophobia” – an obscene stand for them to take after the Charlie Hebdo massacre – and our massive Free Speech Rally outside that event. The Muslim event was held in a hall owned by the local school district. When asked why they allowed that event on their premises, they answered that their hall was open to anyone who wished to rent it. So we are renting it for our Muhammad Cartoon Exhibit. After the Charlie Hebdo massacre – and after the violent Muhammad cartoon riots a few years ago – there should have been cartoon exhibits all over the free world, to show the Islamic jihadis (and their stealth allies in the Organization of Islamic Cooperation and other Muslim groups that are doing all they can to intimidate the West into abandoning the freedom of speech) that we will not kowtow to violent intimidation. But there were no such exhibits. The free world was ready to submit to the savage enslavers. And we hope that this event will give others the courage to stand up as well, and show the world that they aren’t going to submit to this savagery. Otherwise, it is no exaggeration to say that all will be lost. Please help us pay the massive security costs and other expenses involved in this all-important event: Contribute here.